The Crested Canary, originally known as the "Turncrown", is one of the oldest canary breeds still in existence! Today's Crested Canary has had quite a volatile history due to both a fluctuation in its popularity and to the development of other crested varieties. The Crested was perhaps the most popular canary in the late 1800's and was described as the "King of the Fancy". As a consequence of its popularity it became one of the most expensive, eventually being kept only by the very wealthy. Being out priced from the common class its popularity began to steadily and continually drop. About this same time a variety of other canaries were also being developed that carried a crest. Today the number of Crested Canaries, though the dedication of the Crested Canary Club and the Older Varieties Canary Association, is again on the increase. The Crested Canary is a "type canary", bred for physical characteristics rather than color or song. It is one of several canary varieties that has a tuft of feathers around the top of its head. Others include the popular Gloster Canary, the crested Stafford Canary, the crested Norwich Canary, and the crested Lancashire Canary. Distribution: Research indicates that the Crested Canary was developed in about the 1800's and is one of the oldest canary varieties. Originally called the "Turncoat', it wasn't until about 1880 that it was dubbed the Crested Canary. 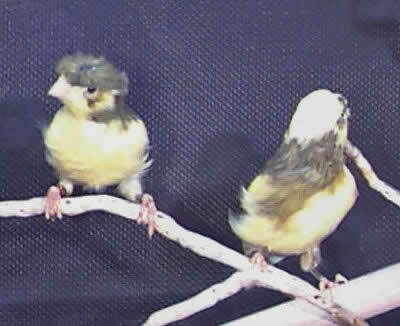 At about the same time several other canary varieties with crests arose, including the Hartz Canary, the Mechelse Waterslager Canary, and the Sakser Canary. Also at this time breeders in England, seeking to enlarge the crest, began to develop a crested Lancashire and a crested Norwich. The Gloster Canary, developed later in the mid 1920's, also owes part of its heritage to the Crested Canary. Description: As its name suggests, the Crested Canary has a tuft of feathers around the top of its head. It has a broad deep body, a short stout neck, and a lot more feathers than many of the other breeds. This feathering is essential for the forming of a good strong crest, which is the main feature of this bird. Breeding the Crested Canary is no different than breeding colorbreds or any other variety of canary... with one exception, Cresteds should only be bred Crest to Crest Bred (see description above). Other pairings could create a lethal factor and poor crests. Availability: Crested Canaries have been fairly rare, though with their numbers on the rise, they are becoming more available. They are most often available through breeders, but may also occasionally be found through bird shows, bird clubs, and on the internet. Hello. I never had canarries before,and bought 2 pairs of red mosaic .After i was told that it is not easy to give colour to these birds. Searching through google i found your page which i find very interesting, and would like to ask you for help by telling me when and how i give my canarries colour durring which piriod and if they have youngsters how i give colour to youngsters. I will be waiting eagerly your answere is much appricated, yours in sports, Natalino Caruana.